The Mayor and Mayoress of Havant, residents and businesses celebrated the opening of a new funeral home in Widley owned by local people. Colleagues at Southern Co-op’s new funeralcare branch in London Road also announced their new charity partner – The Elizabeth Foundation – and gifted them with a cheque for £1,000. 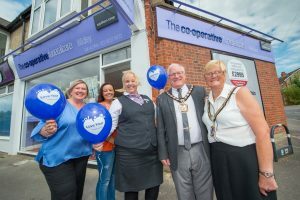 The Portsmouth based charity helps preschool deaf children and babies learn to listen and talk and will now be the funeral home’s partner for one year as part of Southern Co-op’s ‘Love Your Neighbourhood’ scheme. Fiona Heath, Fundraising Manager at The Elizabeth Foundation, said: “On behalf of all the staff and families at the Elizabeth Foundation, we would like to thank the Southern Co-op for adopting us as the charity of the year. The recently opened funeral home hosted the open event on Tuesday 17 July to tackle the taboo of funeral planning and introduce residents to the wide range of services and products available from modern day funerals, such as motorcycle hearses, memorials, eco-friendly coffins and much more. The open evening also included a large raffle to raise money for the Elizabeth Foundation. For those who were unable to attend the open evening, Rianne Rose, Funeral Co-ordinator at Widley Co-operative Funeralcare, invites residents to pop in for a guided tour without any obligation. Southern Co-op is a co-operative society owned by its members who have a say in shaping the organisation’s future and also benefit from a share of the profits.